Mar. 13, 2018 4:30 p.m. He was 21 — the statistical peak age when many people think they’re invincible — and had just suffered a life-altering injury while cleaning underneath a wood chipper at a Maple Ridge sawmill. Johnson was one of the mill’s most reliable workers, but through his eagerness to please and do the job quickly, he didn’t bother locking the machine out. That oversight cost him the use of his left arm. A moving roller caught the tip of his glove and pulled his arm into a conveyor belt, snapping his forearm in half. At the same time the moving conveyor belt chewed into his back. Johnson said it felt like a car doing a “burnout,” spinning its tires into his exposed flesh. “After being in the machine for about 20 minutes, it started to get really cold and I was getting really tired,” Johnson told a group of Grade 10 and 11 students in the Career Education class at Langley Secondary School on March 13. Miraculously, the conveyor belt stopped, though no one had touched it. Ten agonizing minutes passed. Once they realized what was happening, Johnson’s co-workers immediately sawed off the belt and unbolted the roller that had entangled his arm. Johnson was fortunate to survive the incident. His doctors considered amputating his arm but he fought to keep it. Today he has enough shoulder function to tuck it behind his back. 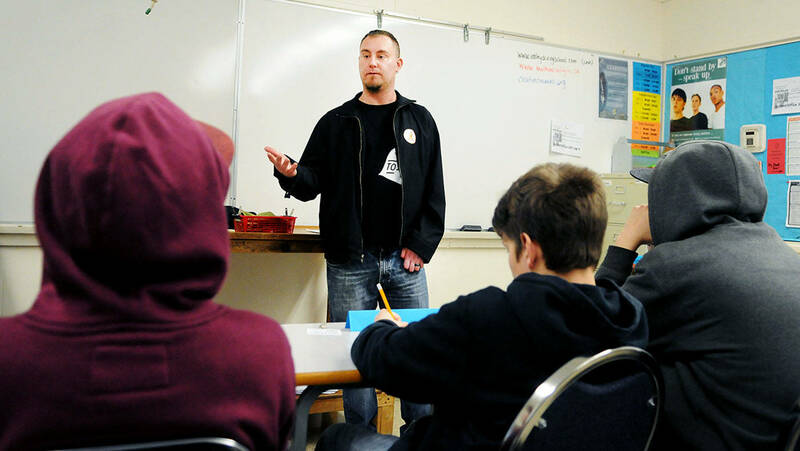 The Maple Ridge resident, now 32, visits schools and workplaces to share his story as part of WorkSafeBC’s Speakers Program. Johnson stressed to his young audience that no job, no amount of money is worth their safety or, especially, their life. He told the students that they have every right to say no if they feel a job is unsafe. Johnson doesn’t want any of the next generation of young workers to become a statistic. Over a five-year period from 2012 to ’16, close to 33,000 young B.C. workers were injured and had time loss claims, and among those close to 3,600 young workers were seriously injured. Johnson’s co-workers couldn’t hear Johnson’s cries for help over the noise of the machines at the mill. Johnson said he had an “overwhelming feeling” that he was going to die. “It was like someone came up and whispered in my ear, ‘Mark, you’re not going to make it,’” Johnson told the LSS students. The first year after the accident, with the nerves in his left arm “massively damaged,” Johnson fell into a deep depression. It spiralled to a point where he contemplated taking his own life. Words Johnson’s dad spoke to him one night gave him a new perspective. “He said he would have killed himself if I had died from my injuries,” Johnson shared. “That had a major impact on me. Everybody I talk to says, ‘You know what? There’s a lot of people relying on you for their happiness.’ So you need to do the best you can to stay safe and stay alive. It took years for Johnson to get back to doing many of the things he loves.